The month of August is a transition time for many – students return to school, families adjust to new schedules, even the weather begins acting more like fall than summer. Bright Lights also makes a transition, moving from five weeks of daily summer programming at Holmes Elementary and other community sites to planning in our Bright Lights office for 2018 classes. While there are fewer people around (seven employees, compared to 1,400 students in the summer! ), the enthusiasm and goals from summer to fall remain the same: create hands-on learning opportunities that will inspire, engage and motivate students in grades K-8. •	Bright Lights celebrated our 31st year serving Lincoln and the surrounding area. •	We served nearly 1,400 students with 113 half-day classes/full-day camps taught by 92 different teachers. The classes were popular, because over 650 of those students attended more than one class/camp. 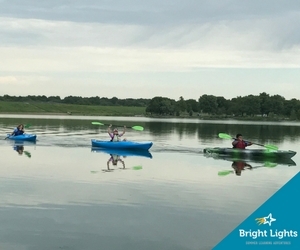 •	Bright Lights partnered with LPS, UNL, SCC’s The Career Academy, Nebraska Games and Parks, Wesleyan, and Southern Heights Presbyterian Church to provide locations and expertise for our students. A special thank-you to Holmes Elementary principal Haeven Pedersen and his amazing staff for welcoming us for a second year and letting us make their school our “home” for three weeks. •	Our International Program, based at Lux Middle School, welcomed nearly 60 students from Japan’s Senshu Matsudo University Junior High School. This is the program’s 16th year. •	Bright Lights awarded 216 scholarships totaling $22,000 thanks to our generous donors and sponsors, giving students who may not have the chance to experience Bright Lights the ability to do so.